Located in the heart of the sunny Algarve at Carvoeiro by a trick of the tides, the small inlet of Carvoeiro is protected between high cliffs. 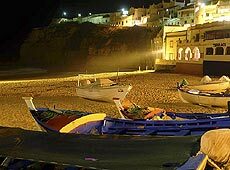 The cove offers shelter to traditional fishing boats, decorated with bright naïve paintings. Cliffs of ochre stone, worn into tracery, line the turquoise sea as far as the Cape. On the way stands the hermitage, the work of man, whilst the strange vaulted grotto of Algar Seco echoes like a Cathedral carved by the wind and the sea. Two magnificent Golf courses and the David Leadbetter Golf Academy in addition to a wide range of luxury golfing properties, either for sales or rentals. Gramacho Golf Course: The Gramacho Course is unique with 27 greens being the only one of its type of design on the continent of Europe; it is one of only a few courses in the world with 18 sets of tees and 27 greens but only 18 fairways. This original golf layout was designed by Ron Fream of Golplan USA and the famous Nick Price. 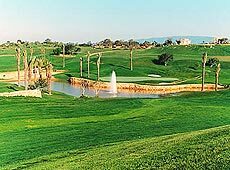 The use of existing features of the land, outcrops of rock, dry stone walls, fig, almond, carob and olive trees, have been augmented by well positioned bunkers and lakes. These hazards, combined with the shaping of the fairways and greens, have produced a wonderful array of challenging but fair golf holes. The designers have combined the hilly picturesque course with the artistic fairways and used the ancient olive trees, some 600 years old, all over the courses. Pinta Golf Course: Design by Ronald Fream of Golfplan USA, opened for play in 1992 and has justly earned a reputation for its excellent condition and its ability to challenge golfers of all standards. The Bermuda grass fairways and Penn Cross Bent greens are protected by well positioned sand bunkers and two ornamented lakes, which are play on four holes. The undulating terrain is liberally dotted with carob, fig, almond and olive trees, some of which are more than 600 years old. David Leadbetter Golf Academy: Located in the heart of the Pinta Course, is a mayor attraction for many golfers. Tuition takes place on the two purpose-built fairways with six target greens and special chipping, bunker and putting areas.